There has been much criticism of China’s Belt and Road Initiative (BRI) in terms of how much money China will leave on the table for foreign participation in project contracts and infrastructure build among the 70 odd nations who have signed up MoU’s to China’s BRI. Diplomats have been put into action to pressure Beijing to release money to foreign contractors, foreign media has often lambasted Beijing for seemingly favoring Chinese companies to do the work, and criticisms have been laid at Beijing’s door about the apparent inability for foreign investors to participate. But, on the other hand, when the BRI is a China initiative, and Chinese companies are by and large competent infrastructure developers, why should China leave part of their huge diplomatic and business outreach to foreign companies? Much of the actual criticism is just another angle of pushing market access in China, which is exemplified by Beijing publishing its annual “negative list” of areas in which foreign investment is both encouraged and discouraged. Before we get into the Belt & Road, let’s just look at where China stands on this. As concerns foreign investment into China, and therefore potential access to some of China’s SOE’s involved in exporting infrastructure development along the Belt and Road, China publishes an annual “Negative List” that outlines the industries in which foreign investment is either barred or restricted. Some of this impacts upon areas such as construction and so on, often with high capital participation requirements, meaning that foreign participation in the Belt and Road is restricted, in terms of foreign participation, to the larger MNC’s with track records and proven regional expertise. Most will already have existing JV’s with Chinese partners. Companies such as Siemens, GM, DHL, Bombardier, and the like are all doing well in China and are seeing their China operations extended into Belt and Road contracts almost by default. There is a caveat here in that China does place restrictions on foreign investment into the country and like many nations (note Trump and his farming voter base) seek to protect what they regard as key industries. There is some justification therefore in terms of China restricting foreign access in certain industries, while the US Chamber of Commerce for one has been critical of China delaying foreign investment access to industries such as finance, insurance, pharma, and so on. The 2018 China Negative List, which explains the areas in which foreign investment is both encouraged and discouraged, together with our analysis, can be accessed here. Criticism of a lack of involvement in China’s Belt and Road projects is largely an extension of foreign investment push back in whatever turns up as restricted areas in the negative list. Taken in that context, it is nothing new. But given that China has both a negative list, and a highly active diplomatic and trade reach throughout Central Asia, Africa, South America and Eastern Europe, how can foreign businesses based in China participate in the BRI? The answer is to explore the available tax incentives, which are actually wide ranging and well defined. West China includes some of China’s most populous inland regions and cities, and all of China’s western border provinces, including Guizhou, Guangxi and Yunnan to the south (bordering or close to Vietnam, Laos and Cambodia), Sichuan, Gansu, Ningxia and Xinjiang, (all of which contain sizable Muslim populations), Inner Mongolia, (bordering Russia and Mongolia), Tibet, (bordering Nepal and India), and the municipality of Chongqing, China’s largest city. An introduction to the available investment incentives can be found here. China has signed numerous DTA’s on a worldwide basis. They are useful in terms of ensuring that businesses are not taxed for the same service or income in two countries, and also often provide for tax reductions or exemptions in specific areas. This can include reductions on VAT on specific goods traded between the two countries, customs duty and tariff exemptions, reductions on profits tax in certain areas, and reductions in individual income tax rates. An example of how this can work is the Hong Kong – Russia DTA, which came into effect in January 2017. Before the DTA came into effect, companies operating in Hong Kong but listed in Russia were subject to income tax in both jurisdictions. In some cases, the taxation of repatriated profits of a Hong Kong company based in Russia would be determined by the tax bureau individually, depending on the source of the income. the tax on income of individuals. The impact this treaty had in the year since it became applicable was a bilateral trade increase between Hong Kong and Russia of 53 percent. Smart investors use DTA’s to access new markets. Foreign investors with fully licensed, tax paying operations in China can also qualify for the DTA that China has agreed with other countries. What double tax treaties does China have along the Belt and Road? As mentioned, foreign companies with resident, tax paying operations in China, such as a Wholly Foreign Owned Enterprise (WFOE) or a Joint Venture (JV), qualify to use these agreements. The easiest way to examine how to use DTA is to look at this complimentary issue of China Briefing Magazine: Using China’s Free Trade & Double Tax Agreements. 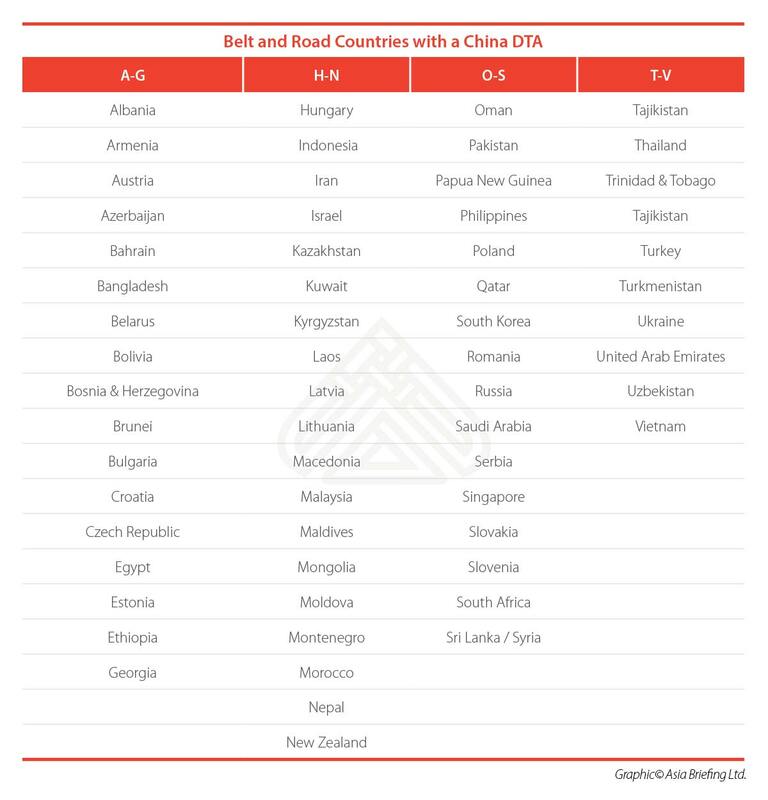 There are other countries along the Belt and Road that also possess significant DTAs. These include Russia, whose DTA can be examined in the article “Russia’s Double Tax Treaty Agreements” and the member states of the Eurasian Economic Union (EAEU). China has recently signed off a non-preferential FTA with the EAEU, a trade bloc that includes Armenia, Belarus, Kazakhstan, Krygyzstan, and Russia, and is an important geographic land bridge as it fills the space between China and the EU. An examination of what that means for Eurasian trade flows can be read here. Foreign companies based in China with resident, tax-paying businesses in the country can also in effect access the EAEU as its member states all have a DTA with China. A complete list of DTA that the EAEU nations have agreed to can be found in the article “The Eurasian Economic Union: Double Tax Treaty Agreements for Foreign Investors and Traders“. Looking further south we have published information on the DTA entered into by India in India Briefing Magazine; in Vietnam Briefing Magazine, and a general examination of Asia here. These are all complimentary publications, and all have pertinence for foreign investors based in China, and Asia generally. FTA’s that China has signed allow for reduced or full exemption of customs duties on items included within the FTA. Important ones from China’s perspective include ASEAN, and the EAEU. ASEAN comprises Brunei, Cambodia, Indonesia, Laos, Malaysia, Myanmar, Philippines, Singapore, Thailand, and Vietnam. Of those, Indonesia, Laos, Malaysia, Philippines, Singapore, Thailand, and Vietnam all have individual DTA with China. Vietnam, incidentally, also has a FTA with the EAEU, one that has seen Russian investment into the country move from zero to US$10 billion in the last 12 months. If companies from these countries have legitimate tax paying operations in China, they can take advantage of China’s DTA elsewhere. Meanwhile, the customs tax free and tax reduction implications of China’s FTA with ASEAN is covered in some detail here, while a recent issue of our ASEAN Briefing Magazine also deals with the opportunities in ASEAN that the FTA provides for foreign investors. China has also signed a recent FTA with the EAEU. At present it is non-preferential and does not include any specific products at this moment. But that will change over time and is worth keeping an eye on. Foreign companies registered in China are classed as legally established Chinese companies. Although China itself discriminates internally against such companies via its negative list, such companies are able to take advantage of China’s Double Tax Treaties and Free Trade Agreements. They possess Chinese business licenses, pay tax in China and are established under Chinese corporate law. Key is the definition of “residence”, which is explained in more detail here. Assuming the foreign invested business in China can prove it is resident, and meets beneficial owner requirements, it can apply for tax treaty status with the relevant Chinese tax authorities. Such certification is valid for up to three years, and is renewable, but must be applied for in advance of using the treaty. This means, for example, that if a European or Asian company establishes a WFOE in China, and the WFOE has actual substance (and is not just a shell, usually proven by providing the past years tax paid certificate and a copy of the accounts), then it will be classified as China tax resident. If this WFOE provides any service, or charges a licensing fee to a company in any other country with which China has a DTA, the WFOE may enjoy the pertinent DTA, which means it may avail a preferential rate according to the DTA arrangement (this often halves VAT and other taxes), while the tax paid overseas is deductible in China as foreign tax credit. Foreign investors in China wishing to take advantage of this process can contact us at china@dezshira.com for assistance. Although, as I have stated, it is difficult for foreign investors to get directly involved and partner with Chinese companies along the Belt and Road, it is possible to take advantage of the opportunities this new infrastructure will bring. Improved connectivity releases market access and increases prosperity, leading to market demand. I wrote about this earlier in the year in the piece “How Foreign Businesses Can Prosper From China’s Belt & Road Initiative: Exploit The Infrastructure“, which also contains a case study of how local and international businesses operating in the tourism sector are now taking advantage of Chinese built infrastructure in Sri Lanka. This exemplifies the type of entrepreneurial initiative businesses one needs when it comes to evaluating China’s Belt and Road opportunities. Armed with double tax and free trade agreements, eligible foreign companies established in China can, without doubt, access the Belt and Road markets and obtain tax incentives and reductions for doing so. This article was first published on China Briefing which is produced by Dezan Shira & Associates. The firm assists foreign investors throughout Asia and maintains offices in China, Hong Kong, Indonesia, Singapore, Russia, and Vietnam. Please contact info@dezshira.com or visit our website at www.dezshira.com.